The "Take It!" came almost in command form. I had just gotten out of my car and was in direct line of sight of the tree which has this powerful imprint upon it. The tree was about 4 feet in front of me and almost demanded that I come and take a picture of this part of it. 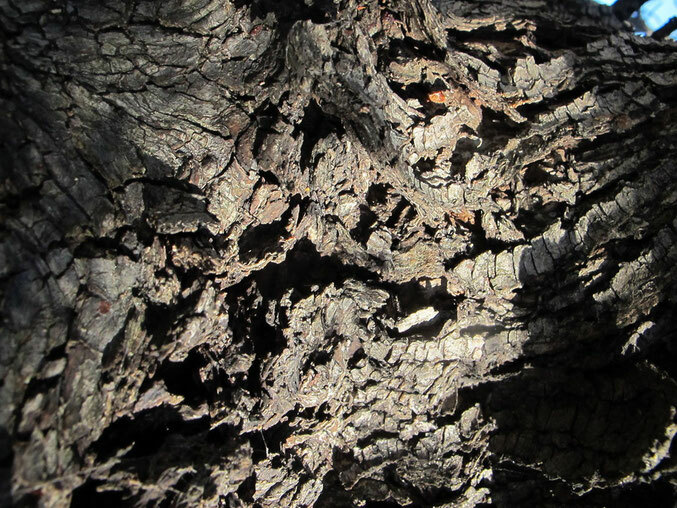 The sun happened to be in just the right position to shed its mid day light upon it for emphasis and the creation of shadows within the bark that has had so much upheaval. I took three shots, the first being vertical, the second being horizontal of the very same location. The second was a few inches to the right and gave a much different picture. The third shot was not even a player. I have gone back to this site many times since the taking of these pictures and never found the conditions to be as favorable again. The After Take: Even immediately after taking the shots, looking at the review monitor, I saw the power in the image. In showing prints of the photo, there has been a universal immediate reaction of a sort of controlled shock. Not umpleasant nor repulsion, just an almost crisis like need to know what is being looked at. Most are able to figure it out in fairly short order, but I do not let anyone puzzle with the question for long. I do not like to see anyone in an unsettled state, plus I want to see them move to what has become almost universally the second step; trying to envision shapes out of the configurations in the bark. Most are looking for face like images, almost like most of us do with clouds when they are of a certain type. I am happy to say that I believe most who look at this picture come away feeling like they have had an experience, with it being one that there is a good chance they will not forget for a while. I am in hopes you enjoyed this picture. I find myself drawn to the surfaces and shapes of trees for they are so representative of what nature has brought us over the years. Wishing you a very Happy New Year, one that we hope finds you taking many pictures of your own, and sharing them with others. It seems this is happening more frequently, and I believe is serving to strengthen our communications with others as well as enhance our lives as we sometimes take unexpected moments to review pictures by ourselves. Especially those taken with our cell phone cameras that are becoming more and more excellent with each new model. It is almost violent looking! Ya I tend to agree, I couldn't take my eyes off it for a good couple of minutes.